EBay's biggest change is the homepage "Feed," which pulls in products from brands that users follow and makes suggestions based on past purchases. EBay is pulling its old clunky site into the modern age with a major redesign and new features inspired by its younger, buzzier tech rivals. "Our site's look and feel has been a little inconsistent," chief technology officer Mark Carges acknowledged at the unveiling in New York City on Wednesday. The redesign, he said, was largely inspired by customers' increasing use of mobile devices for retail purchases. Several of the eBay executives said during the event that retail is "at an inflection point." They're hoping the new features make eBay's 105 million active users want to stick around. A Pinterest-like homepage: The biggest change to "the new eBay" is the homepage, now called "Feed" -- evoking Facebook (FB) in name and Pinterest in design. 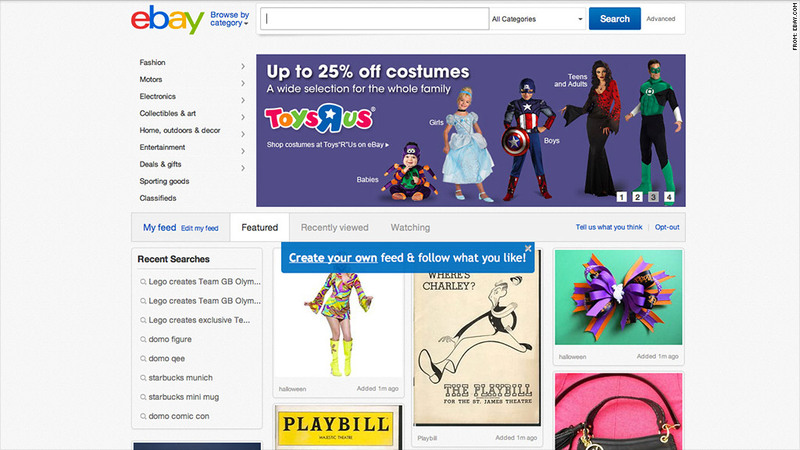 Visitors can opt to follow brands, product types, and anything else that eBay sells. Those items will then pop up on the Feed homepage, in addition to product suggestions based on the customer's past browsing or purchase history. The overall look is cleaner and simpler than eBay's current site, with larger photos, more white space and a focus on "inspiration" and "curation." The idea is to get eBay (EBAY) users clicking around and discovering new products they might like, rather than simply searching for a specific item. Feed will roll out to the U.S. over the next 100 days, with international launches beginning early next year. "Online shopping killed much of the pleasure of shopping ... the emotion, the excitement of discovery," Carges said. He later added: "When you shop brick-and-mortar, you often window shop. You browse. But until now, online shopping has been about search." Google-inspired search: EBay's search also received a makeover, with an autocomplete feature similar to that of Google (GOOG), and a promise of "more relevant" results. Users can opt to personalize those search results. For example: A customer looking for spare car parts can enter her vehicle's make, model and year. From then on, when she searches for parts, she can opt to see only the items that will work with her car. Same-day delivery service, like Amazon: Executives spoke briefly about eBay Now, an app that offers "on-demand delivery service" with goods from local stores. The app is available in Apple's (AAPL) iTunes as of Wednesday, but it's currently running only in San Francisco. An eBay rep said after the event that "more cities will be added soon." Amazon (AMZN) offers "local express delivery" for some items in major cities. Daily deals a la Groupon: One offering that wasn't discussed Wednesday, but is still part of eBay's recent changes, is its Lifestyle Deals service. The Groupon-esque (GRPN) daily deals service launched a few weeks ago, eBay confirmed, and it's currently available in a few major cities: San Francisco, Boston, Chicago, Dallas, Denver, Fort Worth, Houston, Los Angeles, New York, Philadelphia, San Diego and Washington, D.C.
EBay president Devin Wenig closed the presentation on Wednesday with a promise that the company isn't done innovating -- and he hinted he wouldn't let it fall behind again. "We will continue to make shopping more intuitive, more convenient and more relevant," he said. "This is just the beginning."